I recently got around to reading the 2010 book "Identity Economics: How our Identities Shape our Work, Wages, and Well-Being," by George Akerlof and Rachel Kranton. It is a lay summary of some of the work that Akerlof and Kranton have been doing to incorporate identity and social norms into economic modeling of decision-making. Basically, identity economics modifies a person's utility function - in addition to caring about the normal stuff like consumption, people also care about how their actions conform to the norms of the identity that they belong to. For example, if an employer wanted its workers to work harder or better, standard economic theory would suggest that the employer could modify the contract and include standard economic incentives like merit pay or output-based bonuses, since workers respond to these incentives. Identity economics suggests that the employer alternatively could attempt to create norms for the workplace and encourage workers to identify with those norms, such that the norms themselves and workers' identities would provide incentives for working hard. I might work hard or long hours because I get paid more to do it, or I might do so because I feel like I am an important part of a team, and I believe in the mission of the firm, etc. After reading it I was struck by the potential application to environmental policy. We want people to reduce their energy consumption, say, by purchasing fuel efficient cars or appliances. Standard economic theory (Pigou) would suggest that we can price the externalities from energy consumption correctly so that everyone's incentives are such that they purchase the right amount of fuel efficient cars and appliances based on financial considerations alone. Looking out my window, it seems pretty obvious that lots of people who buy fuel efficient cars like hybrids and electrics (perhaps most of them) are doing so for other reasons - and perhaps the financial reasons aren't a part of it at all. People buy a hybrid because they are (or want to be seen as) a "green" - this doesn't mean that they're image-obsessed jerks, but it does mean that identity economics seems to play a part in these decisions. This is somewhat related to the idea of intrinsic motivation, and how it may be crowded out by government policy (some people have studied this in relation to environmental policy). And it's also kind of related to the huge "behavioral nudge" literature on environmental policy (maybe). But I think there's something innovative about the approach of identity economics that can yield some insights into the optimal design of environmental policy. Someone should write a paper, I decided, incorporating identity economics into a model of optimal externality policy. Then a few days ago I see that someone basically did. "Environmental Policy When Consumers Value Conformity," by Alistair Ulph and David Ulph, has recently been online-published by JEEM. Their model is one in which consumers value conformity - sticking with the norms of a group. This is similar to the modification of the utility function in identity economics, though (I think) they don't have in their model the endogeneous creation of norms for different identity groups (e.g. the greens and the browns). This yields some striking policy implications, including the fact that the Pigouvian tax could be welfare-reducing. Here is a link from 2017 with some background: BP has funded a book critical of the CVM. In that post I boasted that my review would be forthcoming in 2018. That boast was a commitment mechanism. 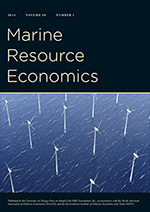 I don't know if it would have worked unless Marit Kragt had not invited me to review the book for the Australian Journal of Agricultural and Resource Economics (thanks for the invitation!). Here is the link: https://doi.org/10.1111/1467-8489.12280. In total, the book presents 11 chapters co-authored by 21 researchers. The majority of the authors (16) are established consultants, and with the exception of chapter 6 by McFadden, all chapters are partially funded by BP Exploration & Production Inc., as reported in the book acknowledgement. The book’s strength lies in the clarity and simplicity of the argumentation presented, with many chapters that do not get bogged down in details and technicalities. However, the reader might worry that BP sponsorship influenced the authors’ objectivity in testing SP failures. The authors are professional researchers and experienced consultants and readers might wonder whether researchers’ expectation (or preference) in poor results impact studies lay out [sic?]. Economists can easily spot a potential moral hazard here! The key meritocratic conclusion that this book suggests is that ‘experts’ are the best judge of many environmental damages and the general public is often not capable of expressing a meaningful value. However, SP valuation economists do not seem to have a place in the ‘experts’ set. It's like, I shouldn't count the health benefit from my oatmeal. It's delicious, that should be enough, boy. Last week the Trump administration took a crucial step toward de-emphasizing the life and health benefits in this calculus when the Environmental Protection Agency said it would rethink a major regulation that restricts mercury emissions by coal-burning power plants. The 2011 mercury rule — based on decades of research showing that mercury damages the brain, lungs and fetal health — is among the costliest but most effective clean-air policies put forth by the Environmental Protection Agency. Utilities estimate they have spent $18 billion installing clean-air technology, and mercury pollution has fallen by nearly 70 percent. Modifying the rule could have an impact far beyond any immediate concerns about the release of toxic mercury into the air and water. In fact, the re-evaluation fits into a far-reaching administration strategy to loosen environmental rules affecting countless other industries for years to come by adjusting the factors used to judge the benefits to human health that the rule has brought. The calculations that the E.P.A. conducts for every major new air or water regulation lie at the philosophical heart of the agency’s work. And its process for that analysis has long been in industry’s cross hairs. That’s because the agency has long counted not just the direct health benefits of pulling a certain pollutant out of the atmosphere, but also what are called the “co-benefits” that occur when, as a result, other toxins are also reduced. For example, in the case of the mercury rule, the Obama administration found between $4 million to $6 million in health benefits directly from curbing mercury. But it further justified the regulation by citing an additional $80 billion in health benefits a year by, among other things, preventing as many as 11,000 premature deaths. Those savings come from a reduction in particulate matter linked to heart and lung disease that also occurs when cutting mercury emissions. So, you can see why industry and the Trump administration is so upset. The co-benefits of 11,000 premature deaths should be worth zero in the mercury rule because mercury ain't whats killing them. At a press briefing in mid-August, Bill Wehrum, the appointed head of the US Environmental Protection Agency’s (EPA’s) Air Office, reiterated the Trump administration’s position that ancillary benefits are not to be counted in cost-benefit analysis of major rules. The context this time was the Affordable Clean Energy Rule (ACE) proposed by the current regime to replace the Obama administration’s Clean Power Plan (CPP). If only the forgone carbon dioxide (CO2) benefits of pulling back on the CPP are counted, the cost savings from ACE outweigh these forgone benefits. But adding the ancillary health benefits that are lost with the ACE rule—the value of 1,400 fine particulate matter (PM2.5)-associated deaths related to greater coal use under the ACE rule—turns ACE into an economic loser, with net social costs relative to the CPP. The overarching response to this statement, as we have written on previously (here and here), is according to (1) theory (basic economic welfare analysis); (2) practice (OMB’s and EPA’s own guidance documents on the conduct of the analysis of the impacts of rules and statutes); and (3) case law—allbenefits and costs of a rule are to be considered. Just because the stated purpose of a rule is to reduce CO2 does not give license to ignore other impacts that occur. Consider how much the administration cares about looking at employment impacts of a rule. Surely environmental rules are not issued to change employment, but are written to protect public health and the environment, making the employment impacts ancillary. Yet the administration certainly wants these ancillary impacts on jobs to be considered, including not only employment impacts but also the ancillary health damages that occur from employment loss. Wehrum’s statement further suggests that he wants the public to trust EPA to “aggressively” target NOX and SO2 emissions in their own right and with the knowledge that they cause PM2.5 concentrations that harm health. Yet, the administration’s proposed rule on the use of science at EPA is targeted at relaxing rules on PM2.5 and its precursors by challenging the science linking PM2.5 to deaths and the process of including these and other scientific studies in RIAs. If Wehrum really believes that we should regulate PM2.5, SOX, and NOX “straight up” to make up for the increases in these pollutants caused by ACE, then the issuance of the proposed ACE rule should be accompanied by the issuance of a PM2.5, SOX, and NOX mitigation rule that would bring these pollutants down to where they would have been under the CPP. Otherwise, the planned actions under ACE are merely about reducing the costs of regulations with little concern about the health impacts on the American people. Note: The new name of the Environmental Economics blog (my posts, at least) is "Common Resources Echo".